The Franklin Co. Board of Elections has posted the candidates that have filed to run. These are not certified, mistakes in the paperwork could disqualify some of them. Four open seats on the council have six candidates attempting to take office. Anthony Panzera, Kearns, and Smith will try for re-election. Stephen Papineau will be retiring from the council. Dan Headapohl, a past council president, will try to return to the council. Nicholas Pavlik, and Melanie Houston will also run for a seat. (later – Nicholas Pavlik dropped out of the race). Current member Truett has filed. Douglass and Evans are stepping away. Only two other candidates have filed, Eric Bode and Molly Wassmuth, so at this point they will get to take office with no opposition. You have to wonder how much the planned major building at the schools have turned off candidates for this office, instead of the usual running the schools and passing normal levies, the board will be tasked with trying to pass new construction levies that will hit record heights. Remember, this is only the first filing list, the candidate must still have all the paperwork in order to be certified. We could still have a shocker election, like 2013, when Clifford made a rookie mistake in her paperwork. (Aug 23) All candidates for council and the board have been BoE certified. 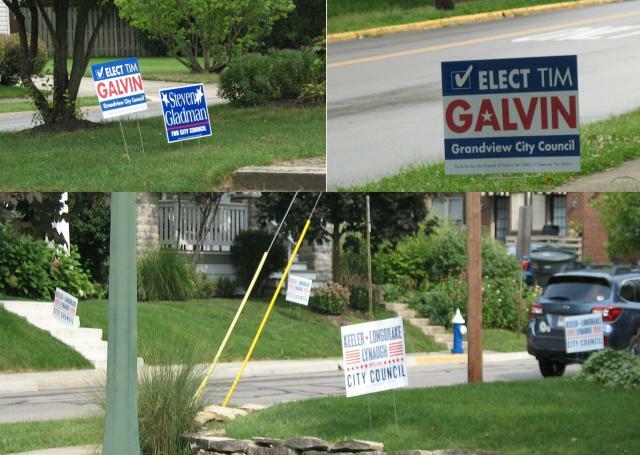 Elections in Grandview Heights are similar to those in other cities. New candidates will make claims that change is needed, those who are trying to hold a seat will boast about the actions they took to deliver services to the voters. We have a big difference from other cities in Franklin County however, no other city is as small and has such easy contact between the voters and the office holders, and office seekers. They are quite likely to be the person living down the street from you. How should we act when we meet a candidate on the way out to set our trash on the curb? What is appropriate to say to a council or board member when you bump into them at the grocery? Democracy works because our elected officials must respond to the voice of the voters, but they have a life outside of the office they hold. The line between private and public is not clear. This is my take on the issue. The first words out of your mouth when you meet an office holder or candidate should be “Excuse me Mr or Ms (politician name), can we talk for a minute about this issue?”. They might say “Sorry, I have to get something done here, can we talk later?” and that should be the end of the conversation. You should hold the candidate to their word, and ask for a time to call, or send an email to them. But you can’t expect a politician to be on your schedule. They might take a few days to get back, that is OK. Some people just feel better pinning a person down and having a face to face conversation. Some people like phone calls. The problem with both of these is that the words you exchange will disappear into the ether after the talking is done, with no record or ability to hold the candidate to the words they spoke. You could tape the conversation with the politician, it is legal in Ohio to record anyone as long as one party knows the recording is being done. But you will only have a recording of a voice, and it is hard to share the record of that conversation. When politicians say controversial things, they often later insist that they were not clear on the question, or speaking off the record, or drunk at the time. Email is written communication that allows both parties to say exactly what they intend. Politicians can’t say “You are asking gotcha questions!” when emailed, they can take the time they need to research and give the best answer to any question. Emails should be courteous but to the point. Some people though are angry at the actions of the politician, when their child is affected by action of the school board, or they lose property value because of the votes of the council, they can sent some bitter and angry emails. As long as the email doesn’t contain a direct threat to harm the office holder, they still need to reply. This is the “heat in the kitchen” and if the office holder doesn’t like it, the exit is always open. A politician may chose to simply ignore your email, and never reply. There are some current school board members who do that, and they have a long tradition of acting like they can trash emails at their whim on the board. If I had my way in a better political system, I would make refusal to answer emails an offense that leads to removal from office. Here in the real world, they get away with it. You might find yourself sitting next to the spouse of a politician at the ball game for your kids. Is it also OK to ask them to discuss the political issues their husband or wife is involved in? I don’t think there is any good reason to ever ask the family of a candidate or office holder to comment on their relative’s political stances. The person who runs for office is the one who asked to be a politician, their family didn’t run. The spouse of a office holder should not be acting as a political arm of the candidate. This is especially hard for the husbands of office holders, they are used to acting as the “white knight” to defend their spouse against all insults. They can get offended if their wife shares an angry email from a voter, and want to speak up in defense. They should shut up and sit on their hands. They were not elected, their spouses took the office, and all the heat that is generated. Again, direct threats of violence are out of bounds, and the office holder may contact the police if they feel they are threatened. But this is still not the business of the spouse, they were not elected. The more people who take an interest in local politics, the better. We need an informed and engaged public, who are not cynical about politicians and the government. Actively seek out the candidates in the upcoming election, and support those who are better for the city and schools. Hand out fliers, post yard signs, and sign support letters. If your candidate loses, take it as a message to do better next time, not a call to shut up and go away. Tax relief or election pandering? Finance committee Chairman Steve Gladman introduced legislation to the city council that would give income tax relief to the Grandview residents who work in Columbus. It sounds like an equity issue when you look at the numbers, but as other council members explained, taking up this issue at the same time the city asks for a property-tax levy renewal next year sounds like they are not really in need of the levy. The projections say the renewal will be needed. And bringing this up just before the election smacks of pandering to voters. I asked Mr. Galdman to explain why this was before the council, and which members were supporting it. J.W. – What was the reason for creating this ordnance? Was there a call for it from city residents? Who asked for the tax relief? Steve Gladman – The reason for the tax equity ordinance was to return to the previous income tax approach of providing all residents with a 100% credit that was altered in 2010 when voters were asked to approve a higher tax rate. The decision to not allow the full credit in 2010 was a business decision In 2010 Grandview Heights was faced with a difficult economic forecast and not providing a full 100% credit was viewed by Council as needed at that time. The granting of only a partial credit resulted in $250,000 of additional income. Five years later Grandview Heights is in a financial postion to return to the previous practice of providing a 100% Credit. One one asked me to introduce this,I believe this is a good public policy and attempted to have this considered by Council earlier in the year but is was not placed on the Agenda. Since I believe policy matters should have public discussion introduced it from the floor. Open meeting law prohibits discussion outside of open meetings on pending legislation. The concept was discussed at the July Finance Committee meeting. J.W. – Which council members have been supportive of this tax-reduction? If you couldn’t get a majority vote to prevent the permanent tabling of the ordnance, why did you think it was appropriate to bring before the council? S.G. – I can not speak for other members of Council, but I believe there is a majority that support the concept of tax equity. Based on the discussion at the last Council meeting there are various opinions about when this ordinance, if passed should become effective. The ordinance was not tabled and will have a second hearing at the next council meeting. J.W. – Why should we not believe this was an action taken only to pander for votes in the fall election? S.G. – I introduced this ordinance because I believe it is good public policy and a policy that I believe is supported by the majority of Grandview Heights residents. I don’t doubt that if you asked the average voter on the street, they would say they want lower taxes. If there were a group of angry voters that brought this issue before the council, it would be a real concern that the city should address. The problem is that as Gladman admits, nobody asked for the tax relief. The job of councilman is to do what is right for the city, and introducing this issue at the same time other members are trying to get support for a renewal levy smells of doing what is right for your own election this fall. I guess that is politics. It doesn’t compare to the time former Mayor Sexton tried to convince the council to sell the city buildings to the banks so they could get a quick cash infusion (as now Mayor DeGraw said, that plan was like taking the city down to the hock shop). It didn’t work for Sexton, she wasn’t re-elected. We will see if this is OK with the voters in the fall. (later) Apparently pandering trying to cut taxes is a valid way to get re-elected in Grandview, Mr Gladman was the only council member to hold on to his seat. The candidate night on the stage of the high school can be summarized as “four knowledgeable people with years of experience, and one person stretching for answers”. The question is, what do you use for a basis for a vote – experience, or something more intangible, like the perceived competence and morality of the candidate, which doesn’t have a number? The stage program asked questions for general discussion by any candidate. I tried to talk to each school board candidate before and after the stage program and asked them questions that were important for each individual candidate. She answered with the standard “open and listening” spiel, I guess what stuck with me was when she said she thought the job was more about doing the right things for the students. I asked her for a good story about embarrassing things that happened at the school, she was enough of a politician to say that would have to wait for some other time. Leutz had one embarrassing incident in 1995 in which he used swear words in front of some students in a civics class and had to send a letter of apology to the school. I asked about it, he said that he has not gotten in trouble like that again. A very interesting story about the incident, he said that at the time it happened he instantly apologized and though that was the end of it. Two months later, as he was nearing the end of his campaign for re-election as Mayor, he walked out of his office and found a news camera pushed in his face as the reporter asked questions about the swearing. The story made the TV and newspapers. He heard later that the reason for all the press attention was because some people “wanted to get him”. He was elected mayor a few days later. Evans and her husband recently opened the Ohio Tap Room, a growler shop that offers Ohio beer on tap. I asked her what kind of example she would be to the students at the school who might get in trouble with the rules for alcohol usage at the school. Kids can be highly tuned into the hypocrisy of the adults that set the rules, and a board member who makes money from beer while telling students that it is bad for them will set those detectors ringing. She said that her tap room was not a standard bar, there were no drunks hanging around it. True, but it doesn’t change the “profiting from alcohol” part. She said they don’t serve intoxicated people, are very strict about checking I.D.s, and want responsible drinking. All standard bar owner mantras. None of them change the part about “the more people drink, the more money I make”. She said that alcohol use was a deeply ingrained part of the community, and that the best we can do for students is to show them how to be responsible. That is the most true thing she said. But it doesn’t change the fact that she is a bar owner, and maybe we should be setting a higher standard for the board members. Speaking of someone who doesn’t meet high standards. I have been wondering about people who are supporting Truett, and I spoke with one of them in the hall. Their take on Truett’s leaving the school and turning in his teaching license – “That’s water under the bridge”. There is forgiveness for minor things gone by, and there is closing your eyes as a flood of water passes under the bridge. We don’t know how close Truett came to being charged with sexual battery. He’s not talking. I asked Truett why he gave us two different stories about his departure from the school. He said no comment. I asked him just what exact kind of relationship he had with an 18 year old student while he was a teacher. He said no comment. I have a suggestion for Mr. Truett, after you have just told someone twice “no comment”, don’t pull out that “I have been transparent with the community” line that your lawyer told you to say. Because it makes you sound like a big liar. He got away this time. If I had talked to him, I would have asked him if his construction company, which built the artificial turf football field, was going to be bidding on the $200K+ resurfacing job that will be needed on the field soon.